The Lord taught us to pray, “Lead us not into temptation, but deliver us from evil.” ~ Matthew 6:13. It’s the oddest of requests really. Why in the world would God ever lead us INTO temptation? Do we really need to request that God not? Yet, I have been feeling a bit tempted lately. For me this generally begins with a thought. When the thought occurs, I know it is temptation. It is not nice or not helpful to think it, but it doesn’t seem all that bad, really. As long as I don’t act on the thought. Well, temptation is a slippery slope, and like most slopes, if you stop yourself before it gets too steep, you have a better chance of not falling. So, I had this other thought. What if, whenever I felt tempted, I just spoke the words to myself: “Lord, lead me not into temptation…”? Wow! Think of the evil I was delivered from! Ha. And I thought I was doing pretty well. (see validation/admiration above) Guess this is gonna be a greatest hit on my prayer list. The disciples asked Jesus, “Teach us to pray,” but was that what they really wanted? To learn how to pray? Or was their request really, as Jesus knew, for Him to teach them to listen? What if what we call the “Lord’s prayer” or the “Our Father” isn’t just an outline for how we “should pray” or the format for the “perfect theological prayer” but the kindness of God showing us how to reach Him? And a way to show others how to reach Him? So… she prayed for a long time and it was clear she should retire. God showed her this when she listened to God in prayer. That’s not the voice Lauren heard when she listened, or at least not the one she chose to follow. She heard, “Play for My Glory and all will be well.” True, they won, and the world thinks all is well. But for Lauren, playing was Glory: the outcome she had given to God. Her decision for a life course did not rest on winning or losing. Ironically, having the decision made probably boosted her to play her very best. Holiday’s story, and her wonderful sharing of the truth without agenda or podium, leaves me speechless — and listening, for myself and for my children. If they were faced, as they will be, with BIG decisions, life-changing moments, and huge round-abouts, would they choose prayer? 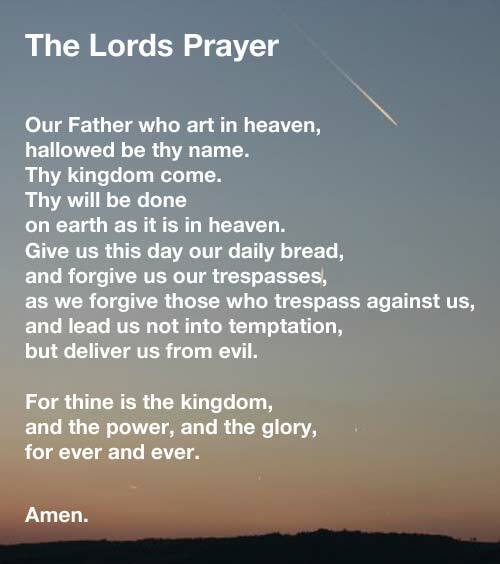 Have I done more than instilled in them the words of the Lord’s prayer? Have I helped them listen under the words? Have I shown them the calm in the silence after the question? Have I encouraged them to trust in the voice that speaks in that silence? Have I been Christ to them? How powerful is that on-going conversation with God about how to lead life. He doesn’t ask that we trust and obey, only that we listen and pray. That’s how we will come to trust the Voice that speaks completely for our good. That is not just the voice of reason but the Voice of Life itself. Oh Loving God, how kind you are to give us more than we ask, by offering all that we need.